The centre wicket at Hope Valley Oval has seen A LOT of cricket.. and a lot of footy for that matter. Over time, this most-used section of any multi-use oval, wears down. Planning is well underway to rejuvenate and re-level Hope Valley's centre wicket area, which essentially involves digging up the surface, installing new drainage, and then bringing in new turf and making the centre wicket the highest part of the oval, instead of the lowest. The oval will bounce back faster for cricket season and will drain better for footy. It benefits our senior and junior football programs - who can look forward to less mud - and for our cricket sides, it means premium, flat pitches for many years to come. Not an inexpensive exercise - over $50,000 would be a reasonable estimate for a high-quality outcome. Hope Valley affiliates and non-playing stakeholders will contribute to the project. For the Hope Valley Cricket Club (HVCC), we have set a goal to raise $15,000. We're calling our fundraising effort, the 'PITCH IN' Campaign. Individuals and businesses 'pitching in' to help produce a superior playing surface at Hope Valley Oval. The HVCC committee are looking for local businesses, life members, club members, past players, and philanthropic friends & family of our playing group and Club, to 'pitch in'! 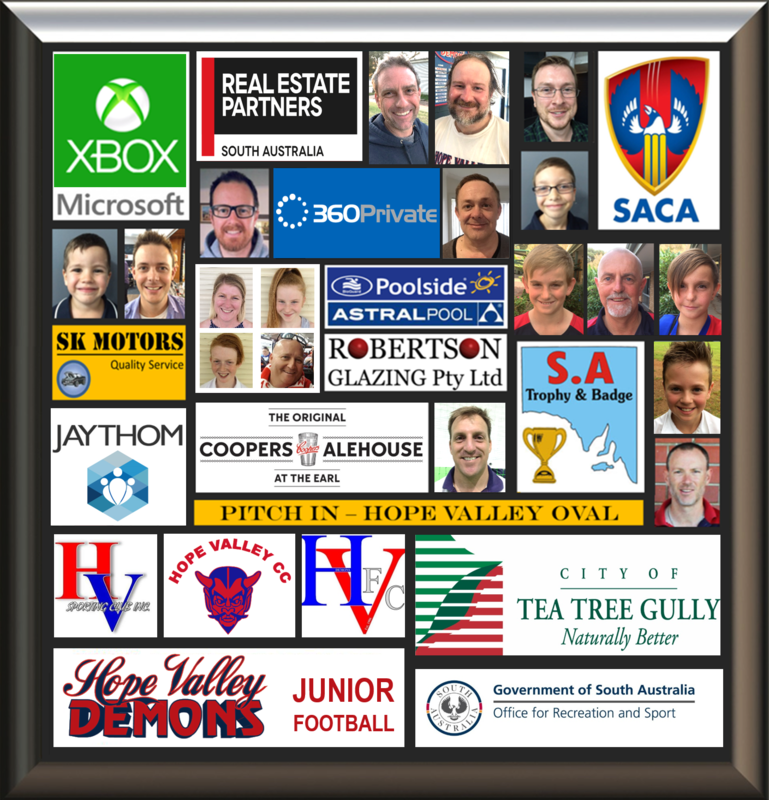 To thank our contributors, we will produce and hang a large, framed print in the clubrooms, featuring all of the faces and business logos of those who’ve 'pitched in'! The print will be displayed in the clubrooms for many, many seasons. For individuals, contributions start from just $25. For businesses, most contributions (70%) have been amounts of $250 or more. The larger the contribution to the project, the larger your logo! As at mid-April (2016), our total is approaching $2,500 and in the mock-up above, are the faces and logos of genuine contributors. To 'Pitch In' and feature on the print, please send me an email at juniors@hvcc.net.au. With your email, include a head-shot or a company logo, and complete your contribution by EFT (BSB: 105 159, Account Number: 26926540, Account Name: HVSC Cricket, Reference: "Pitch John Smith", or "Pitch ABC Pty Ltd"). Let me know if would like to pay via alternate methods, including if you require a tax invoice.